IronWorker is a containerized background job manager that gives you incredibly fast, super-scalable architecture with almost no code. Because it handles tasks asynchronously, any web app can offload heavy lifting such as slow database operations or large data processing to IronWorker without slowing down your users’ experience. But there’s one problem—if a background worker is talking to all of these services, where do the secrets go? Docker containers are fantastic packages for consistent code runtime, but it’s no place for secrets to live—cached and available to everyone that can access that Docker image. 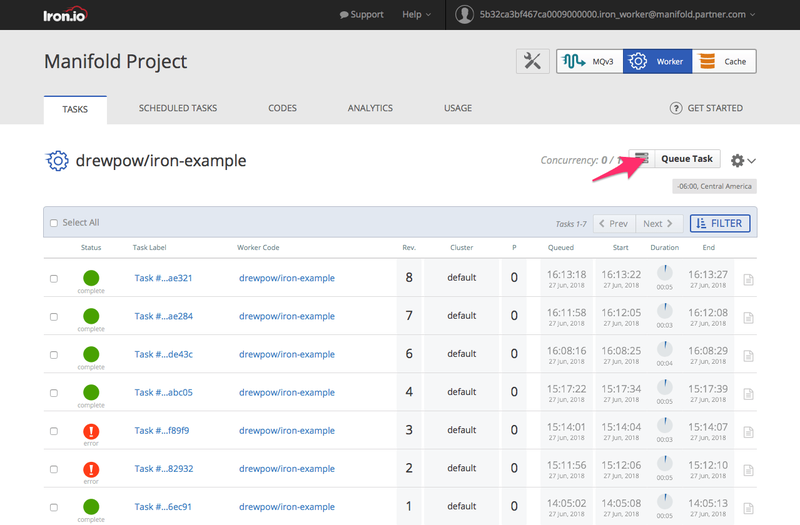 Manifold gives you a 2-minute setup to IronWorker (and many other cloud services) — and it can also solve the problem of secrets for you, completely free. As developers ourselves, we built the tools we’d like to exist. We’ve been using this internally for over a year, and think it’s a pretty great solution. 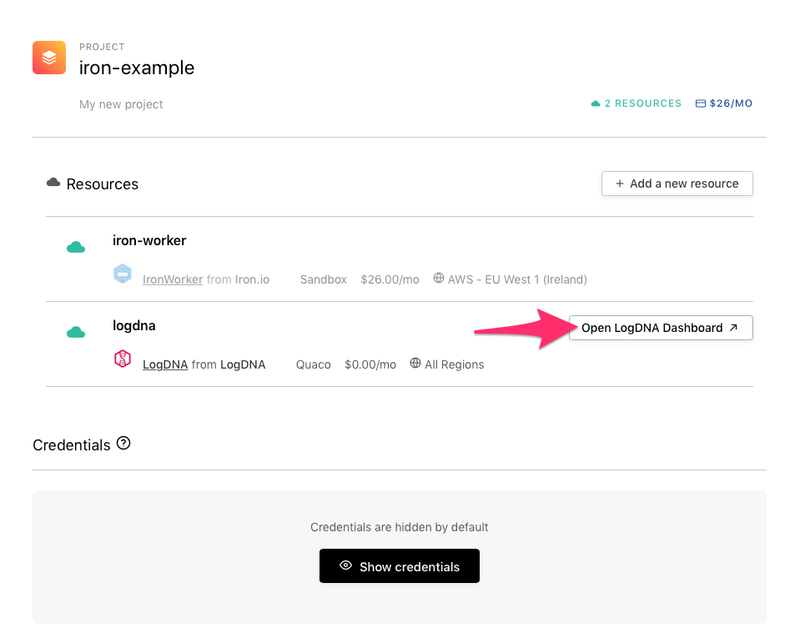 For extra fun—and to see how secrets work in practice—we’ll hook up IronWorker to another Manifold marketplace service, LogDNA, to enhance the experience with realtime logs. On IronWorker, you don’t get to view a single log until after a task is finished running (or erring 🙃). So taking advantage of a cloud-based logging service to give you realtime updates is a huge win, especially for large tasks. What can I use IronWorker for? IronWorker is just one piece of the Iron.io devops suite of products. Using IronWorker, you can handle several incoming tasks at once from multiple sources, sort the queue by priority, and monitor the status of all of those concurrent tasks. It takes care of big, slow, heavy stuff. Sign up for an account on Manifold (it’s secure, free, and you can cancel at any time). From your Manifold account, create a new project. We’ll call it iron-example in our post, but name it any kebab-case name you’d like! From there, provision LogDNA and IronWorker plans to the project. 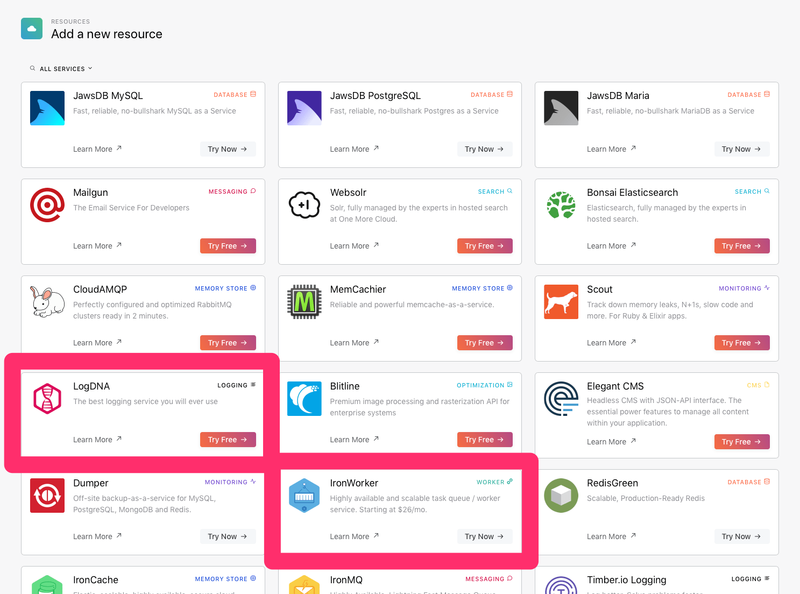 Discover and manage cloud services in the Manifold Dashboard, most of which have free plans. Already have an existing IronWorker or LogDNA plan? If possible, we’d recommend signing up through our Dashboard to take advantage of single sign-on and aggregated billing, but you can still power your pre-Manifold account with our integrations. To integrate your existing accounts, click the “Bring your own service” button and entering your credentials: IRON_TOKEN and IRON_WORKER_PROJECT_ID for IronWorker; KEY for LogDNA. Enter your creds to your service here. You can control access to these if you create a Team, and make a Team project! Back in our project, we can now see the new LogDNA and IronWorker services present. Click Open LogDNA Dashboard. With Manifold’s single sign-on we get to skip signup and go straight to our project’s LogDNA dashboard. Click the Everything tab to see our app’s logs. It’s empty for now, but we’ll come back to this screen in just a moment to see our logs. Now that we have LogDNA and IronWorker accounts managed in Manifold, let’s get some worker code up. …and a final log showing us the job’s complete. IronWorker runs off Docker Hub, which is great news for the many dev teams already using it. And if you’re new to containerization, Manifold can help make adoption relatively painless. Our app uses a custom Dockerfile (first letter uppercase, no extension) in the root folder of our application, configured for Manifold CLI within IronWorker. Assuming Docker is running, and we’re logged in with docker login, we’ll build a new Docker container and tag with -t. You can think of tags like versions of your code, so every time you make a change, you should give it a new tag. A common format is DOCKER_USERNAME/APP_NAME:VERSION (e.g. : manifold/iron-example:0.0.1). In the following examples, replace USERNAME with your Docker username. After it’s built, we’ll send it to Docker Hub. 💁 Tip: testing stuff, or pushing an unstable version? Append -rc.0, -rc.1, etc. to the end of your tag to keep your versions clean. Keep it secret, keep it safe! You won’t be able to retrieve this later. But you can generate a new token, or deprecate an old token at any time with manifold tokens --help. This is using manifold run to inject variables attached to our iron-example project (-p). It’s running the iron register command, injecting a single runtime variable (-e): our Manifold token from the previous step. Our final argument is the tag of the image we just pushed to Docker Hub. Note: to improve security and performance, Manifold isn’t a proxy; it only injects the secrets. Your app connects directly to all these services with no middleman. 🎉 Woo! 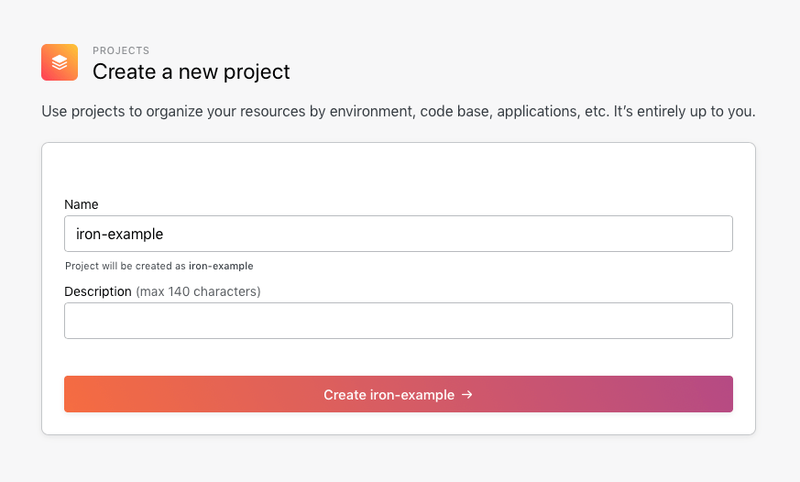 🎉 Iron.io is now running our worker code, ready to be assigned tasks. docker build -t USERNAME/iron-example:0.0.2 . Note: this was the shortest amount of typing I could think of without committing a sensitive secret to version control. If you can think of an even shorter way to run this, leave a comment! Now comes the good part: actually seeing our app run. Sign in to your LogDNA dashboard again from your Manifold project, and navigate to Everything. Also sign into your IronWorker dashboard, and click on the name of your image. Clicking on an image in IronWorker shows you all your tasks, along with the version that ran them, logs, and other pertinent data. You’ll see a screen that shows you all your queued tasks, and which tasks ran successfully and which erred (green and red in the screenshot). This will be blank if you haven’t queued any. 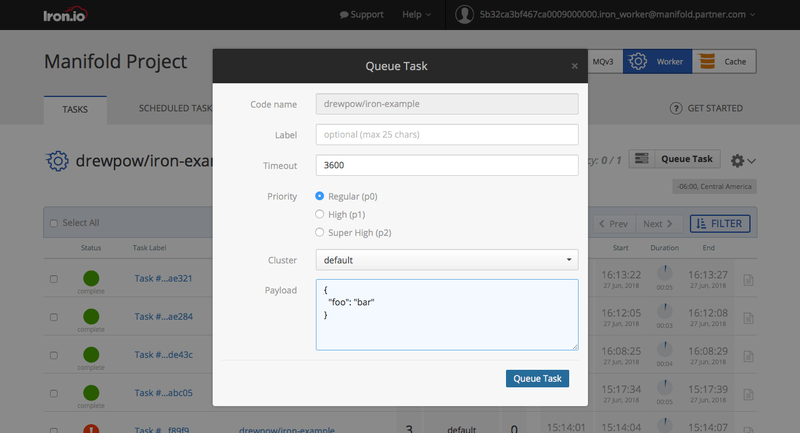 From that screen, click the Queue Task button to test our code. We see the thing we typed! That’s a very good sign! Our app now takes the payload received from IronWorker through IronWorker.params(), and logs it to LogDNA. This means that your code can be dynamic, accepting a wide range of inputs and tasks based on the data it’s given. IronWorker.params() will be your entrypoint to any kind of data needed for your super special task. Running tasks manually gets old real quick, especially because we’re developers and will automate anything we have to do three times 😎. Now that we have a worker with running code and able to handle payloads, we’re getting into serious territory. I’ll end the post here, showing how to schedule tasks from the IronWorker dashboard, as well as programmatically from another application. 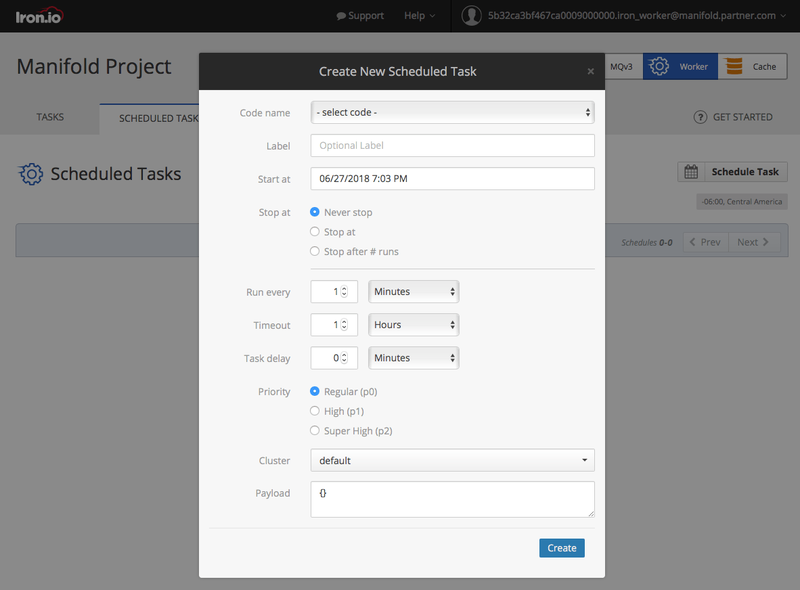 Here, we can also take a payload as with the manual task, but now we can schedule automatically recurring tasks, like a cron job on a server but with no server or cron jobs to manage. If your app can run automatically, such as a newsletter or scraper, this is probably the best place to manage that schedule. Note: remember we didn’t have to authenticate for our worker running on IronWorker, but we will have to for outside apps. So for any large, arduous, async job, we can simply kick it to IronWorker from any app, and go about our business. In case your stack isn’t in Node.js, fret not: IronWorker client has first-class support for Golang, Ruby, Java, PHP, Python, and .NET too! We can’t schedule from outside our app, because ideally scheduling should be self-managing! To recap: you can schedule from the IronWorker CLI or the Dashboard, or you can queue from anywhere using the IronWorker client. Consider a different approach if you’re trying to schedule a repeat event programatically. To learn more about queueing, see the docs on IronWorker client. From here, the sky’s the limit!